When sending images or exporting them from your post-processing software, you might be including sensitive EXIF data that contains such information as your camera, lens, exposure settings and even potentially your GPS location inside those images. That’s because most cameras today automatically embed this information to images. In this article, we will go through the process of removing EXIF data from your photographs using different tools. To remove unnecessary junk from JPEG files to keep them smaller, yet retain important EXIF data such as shutter speed, aperture and ISO. I personally use the last reason to keep my files a little smaller and to make sure that unnecessary junk does not get written into my JPEG files. However, in many cases, you might want to remove sensitive data such as your personal information and GPS location from every image you are planning to send or upload on the web. XMP also defines particular schemas for basic properties useful for recording the history of a resource as it passes through multiple processing steps, from being photographed, scanned, or authored as text, through photo editing steps (such as cropping or color adjustment), to assembly into a final image. XMP allows each software program or device along the way to add its own information to a digital resource, which can then be retained in the final digital file. Is this good or bad? Having XMP in your original image files is definitely good, since it retains your settings in case your post-processing software. However, why would you want to keep all of it in exported images? I opened an image using an ASCII text editor and look at what’s in that file – that’s in addition to the EXIF data that is already stored in the file header. Scrolling down, I could see everything from White Balance to Saturation and Hue adjustments I used in Lightroom before exporting the image. Worst of all, the file even included ALL of the image history, including what I did in Photoshop and how many times the image was saved! I applied Tone Curve to my image and as you can see, the history is right there. Imagine how large your files can grow if you work on them multiple times! In addition, why would you want to preserve the thumbnail of the image (saved inside the image) that is being exported for the web? Let’s now talk about how you can either completely or partially remove both EXIF and XMP Data from an image. 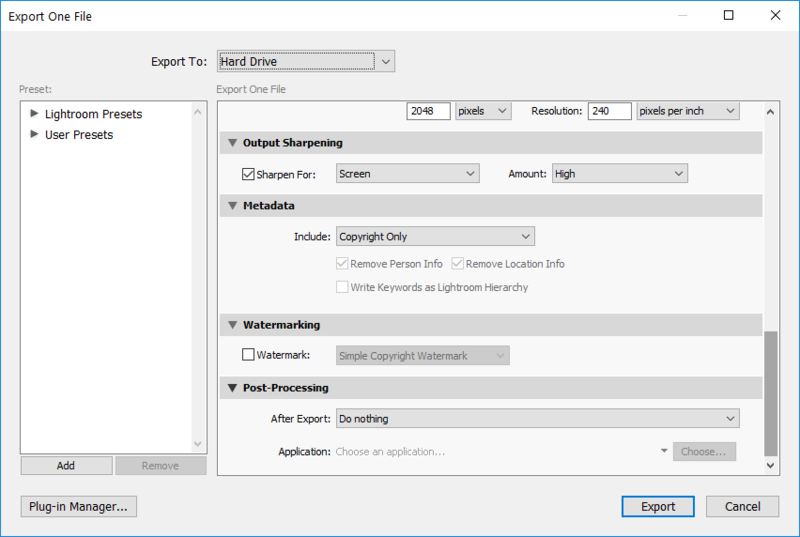 There are multiple ways to remove EXIF and XMP data from JPEG files – you can either remove EXIF data completely, or you can choose what to keep, while deleting specifically what you want. 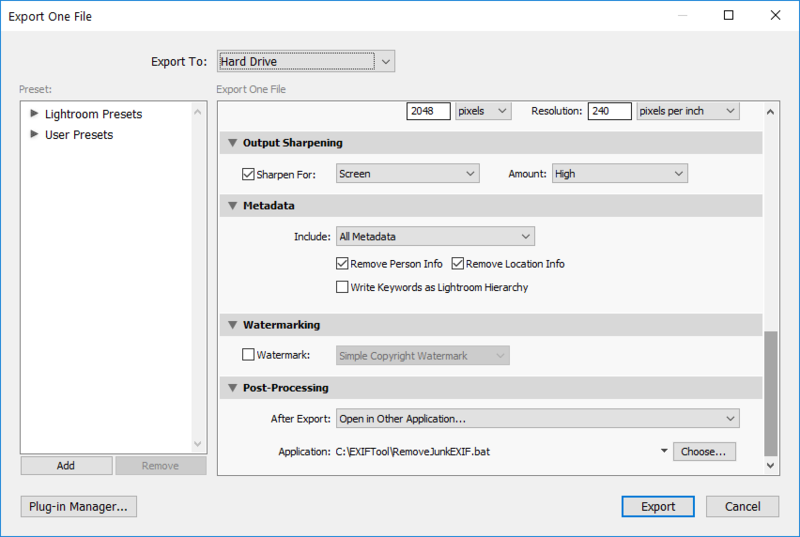 Once you save the file, all EXIF and XMP Data will be gone! However, this only does what it says – it does not completely remove all the metadata. While things like your camera information, exposure settings and XMP data will be gone, your copyright information along with an embedded image thumbnail will be preserved. Unfortunately, Lightroom does not give an option to strip all the metadata from files, so you will need to use other tools to do it. Obviously, replace SourceFile.jpg with the name of the JPEG file you want EXIF data deleted from. As a result, all metadata, including the image thumbnail will be stripped from the file. If you want to remove EXIF data from all images in the same folder, specify “*” (without quotes) instead of the file name and it will go through every image. This part is for those like me, who like to keep important EXIF data in their images, but want to get rid of all other junk such as XMP Data and image thumbnails from their images. There are two ways to do this – from Lightroom directly, or from a command prompt. I personally like to do it directly from Lightroom, because it saves me a lot of time. If you already have a bunch of exported files, it might be easier to just run the tool from the command prompt. Now save the file as “RemoveJunkEXIF.bat” in the same folder where you saved the exiftool executable. You should now have two files in that folder. So, what does the above batch file do? It basically calls exiftool, removes all XMP Data, IPTC Keywords and image thumbnail from your file, while keeping the rest of the EXIF data intact. The option “-overwrite_original” makes the tool overwrite the file, rather than creating a separate file and renaming the original. Now click “Export” and make sure that you are not getting any errors. If the export succeeded and you did not receive any errors, you are all set! Next time when you export your images, this setting will be preserved and your EXIF data will be correctly removed from your files! Obviously, if you are on a different platform or placed exiftool in a different folder, just change the folder path above and everything should work perfectly! I just wanted to say that your article was informative in ways you might not have intended! I found it because I was having trouble retaining my EXIF in JPEGs made from Photoshop files. But what I learned here is how to set up a preset in Lightroom for exporting my images as JPEGs in the size I want them. I’m a very new LR user and there’s no manual. And on dial-up, the online help just doesn’t load. I knew there had to be a way to export a JPEG that was larger than 640 pixels wide, but couldn’t figure out how until I saw your screen shots and realized that the export dialog box had a scroll bar! All I saw before that was the Export Locations, File Naming and File Settings options. I guess I am getting blinder as I get older, LOL! But once I realized there were more options I could scroll to, I was good. Cynthia, thanks for stopping by and dropping a comment. I’m glad that you found my article useful! Please let me know if you have any questions. Thank you very much for every thing! I read some articles of you and hope read everything. Those are very helpful. And I managed to put a comment and read EXIF data by using third party tool name “photoscan”. By the way Nasim, I live in Sri Lanka and If you happens to visit this Inland I would like give my fullest support for you. Sorry Nasim, It was a lot of talking but as usual nothing actual. So it worked zero. The point is one needs to remove the name of the owner in a file which is his computer name and apparently he does not want to send a file with this data. Neither Photoshop nor any your mentioned software can solve the problem. On the other side I do not see the reason to remove anything else from the file. Sorry but all you have written was waste of time. John, what do you mean by “needs to remove the name of the owner”? Owner of what, where? The above instructions are for removing EXIF data from files. I too have this issue. In Windows, if you go to check the file’s “owner” and “computer”, that data is still present, even after using the Photoshop method of removing metadata. what’s about copyrights if you completely selling your photo to another party ? In my camera club, we are required to remove all personal info before submitting difital images. I don’t actually know why, but it would seem it’s a common thing for camera clubs. Could you please share with me the name of the ASCII text editor that you have used above? I tried using notepad but that was chaotic. I would greatly appreciate knowing this! Your article is insightful. 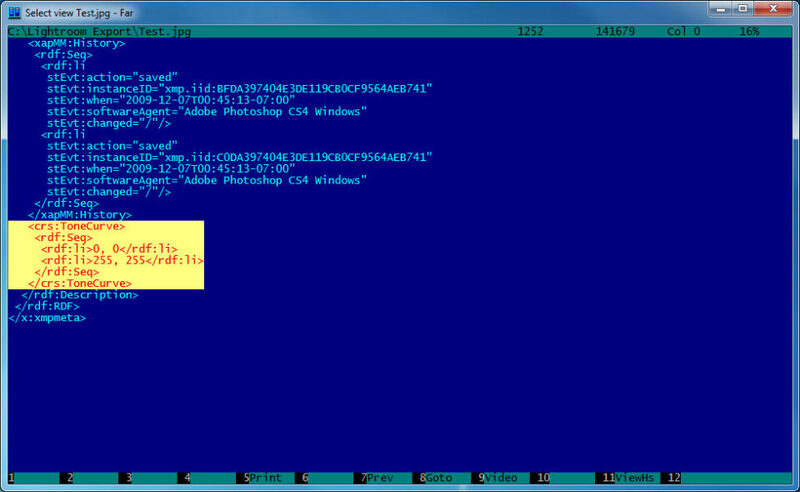 2- re-dates Windows files creation+modification dates so that they becom in sync with file names. item 2 above is ready and working, I’m now working into include EXFtools to it. With this procedure, only the image content is copied, not the EXIF data. For a small low-res photograph I had, the jpeg file size changed from 22 kb to 12 kb. However, this is bad method, since it will re-compress the JPEG data, leading to quality loss. The exiftool method (or any other method which only modifies the EXIF metadata) will not alter the actual image contents. I run the tool and found a bug: for long file path, it doesn’t work or outcome lower success. please resolve this bug. I have been researching this EXIF information thing for two days now, which is how I came be on this page. BTW, EXIFTool didn’t work for me at all. I may have done something wrong but I’m pretty sure I didn’t, being a DOS programmer from way back. Anyways back to my story. I am one of those photographers that LIKES to have my copyright info in the photo files. What I don’t like is all the TAGS put in there by other software like Photoshop which adds about 50+ tags (items) of information. So I was searching for software that I could used to SELECTIVELY remove only some of the tags. No such luck. BUT what I did find was a niffty program called “JPEG & PNG Stripper” which removes ALL the metadata including the thumbnail image and all I had to do was drag the image file over and drop it in the strippers window (lol). Now since I like to keep my copyright info in the files, I found another cool program called “Exifer” that I use to backup the ORIGINAL metadata info before modifying the image. Then after the image has been adjusted with photoshop and saved, I run the stripper to strip out the new metadata then run Exifer again to restore the original metadata back again. — If your looking to remove the thumbnail image – this step puts it back in again so you should remove it before backing up the metadata. I don’t mind the thumbnail being there so I didn’t look into getting something to strip just that out. 2 – edit the image with photoshop and save it. 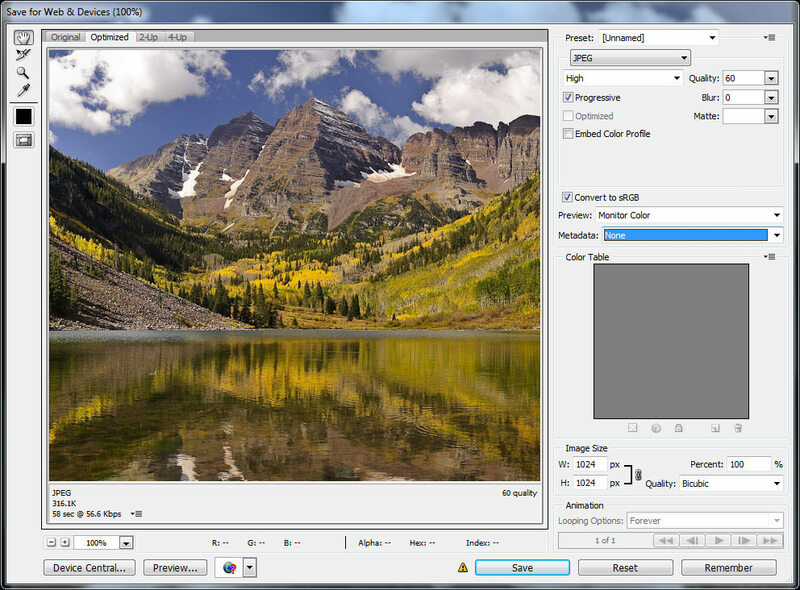 4 – use Exifer to restore the original metadata back into the image file. That’s all there is to it and it works great. I have run this on over 400 images today. Thanks for the helpful tip about the “Save for Web” dialogue box in Photoshop. My photos are being used commercially in an iPhone app so every bit of size reduction helps. Also they need to maintain a single branding on all property in the app for legal reasons. For anyone who sells photos there are legitimate times when they want to keep the metadata and equally as important times that they want to remove that same data. I can’t believe the number of people above who have followed a link to an article on removing metadata, have read the article on removing metadata, and then complained that you have shown how to remove metadata. I am sorry but I think I am missing something. I just tried to export image using LR with metadata such as Artist Name (Myself), Copyright Usage terms etc… The image was exported with this information. I viewed the property of Image (right click-> properties -> Details) and found out that all the property values can be edited… how does writing metadata esp, artist info to image actually help with original work?.. it looks like all these fields can be replaced by a person who may want to plagiarize? Thanks a lot for this! It was very helpful, much appreciated! The article is fine, and much needed to share the issues and solutions. I too use Phil Harvey’s exiftool which is by far and away the best and most comprehensive tool available as it runs on virtually any platform (including of course Windows, Mac, & Linux, but much else too). It does however have a huge downside, the modern computer user is largely command-line illiterate so finds command-line tools and utilities such as the basic EXIFTOOL hard to grasp, especially in my experience MS Windows users, as they rarely if ever use the CMD command-line and often don’t know even to ask for help with any issues especially things like single- or double- quote usage and variables. My suggestion therefore is if you (or one of your team) could perhaps put together a very simple tutorial about getting started with EXIFTOOL (at least on the common WIn/Mac/Linux platforms) and then how to do a few simple operations culminating with your “removing EXIF data from your photographs” basis of this article. Lines separated for (some) clarity – note I use variables but have written what they are above, again for clarity.